Thank you to Annaleis for updating this tracking sheet on Sept 18, 2017. Tracking, planning, and recognition are so important in Cub Scouts. 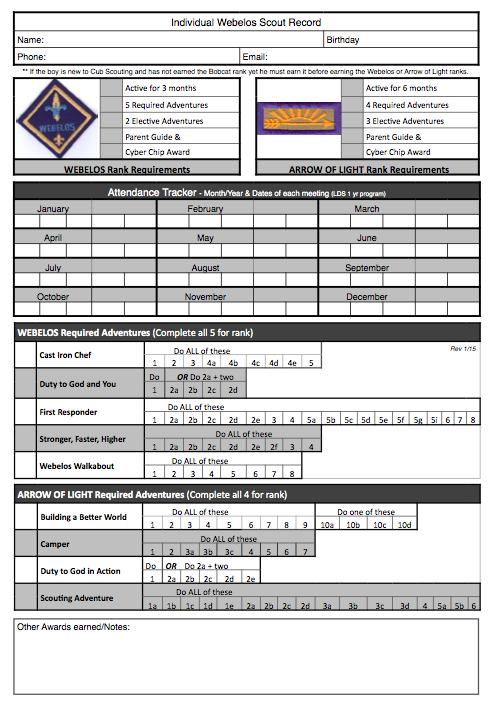 This new tracking sheet will help you be able to keep track of where each boy is at towards the Webelos and Arrow of Light requirements. I like to print this tracking sheet on cardstock, and I print one sheet for each boy to be kept in my leader binder next to their tracking sheet for their Religious Award. I keep a different tab for every boy with all the tracking sheets (Age Group & Religious Award). Then I have complete information on each boy. It helps to do it this way if you do one requirement one week and a different one other weeks. Not every boy is there every week. By doing this, I can always know where each boy is at, and it is all in one place. I keep a roll, and next to the roll I write down what we did that week, and then every couple of weeks I update all the tracking sheets for every boy. If the parents ever have questions, I always have a place to look back at on the roll, and I can always copy each tracking sheet to show them where their boy is. Thanks to Annaleis Smith from the Utah National Parks Council who shared this tracking sheet with us. Do you have one of these for Webelos for the OLD program? My den will be the last den finishing the old program because half the den have 12-13 of the 20 pins. I have been trying to print the new Webelos tracking sheet, but am unable to print it on one sheet. Any suggestions? I struggled with this as well, after multiple clicking and trying different ways I think I figured it out. When you click the link "To print this NEW - Original Webelos Tracking Sheet, CLICK HERE (updated 9-8-15)" it opens the file in a new tab through Dropbox, there should be a bitton towards the top right corner that says downlaod. Click download directly and then it open the tracking sheet in adobe with only 2 pages instead of the 4 I kept getting. Hope this all makes sense and works!! The link for the updated 9-8-15 Webelos sheet is not working. I made it so it printed at 90% the size and it was able to print correctly. I have been using this great printable but there are a couple of errors that need to be updated. It is missing First Responder 5h and Into the Wild should be Do 6 of 1-8 and in 9 do a or b. Any chance of getting an update? A special thank you to Annaleis Smith who appreciated your comments and quickly made some changes. The new changes are updated so download the file again and see what you think! The Webelos Tracker is missing Readyman requirement 5h. My name is Eric Van De Ven, I am the secretary for our pack, 822 and I have all of these New requirements forms in an executable pdf form. How do I send them to the owner of this site? I have also made improvements to the Traxx tracker which auto-fills the parent information based off of your main roster. I am finishing the webelos/aol sheet now. All of the files are in this folder. In order to use these files, Make a roster list and fill that in. For each tracker list, copy 1-20 scouts from the den sections of the master list. Paste that in the "contacts" sheet on the traxx tracker. Do this by selecting the first box, where it says "scout 1". The parent information page will now be populated. That page is protected, but there is no password required to unlock it. When we have our school night for scouting, everyone who signs up, fills out the master registration form. We have the parents do it as they know the information. Now, after everyone has signed up, you copy the individual den sheets, from the master registration sheet, to the pack contact list under the existing scouts. You may lose some scouts from the previous year, and of course you will delete them, delete their information only, do not delete the "scout 1-20 column" on any of the lists. After your Pack contact list is finalized, then, select 1-20 all the way "from Scout 1" to "city/zip code". Paste that to the contacts sheet. If you do not do all 20 at the same time, it messes up some of the parent information. If there are any questions, just leave them in the comments section. So it looks like a program update just came out, and it changes quite a few things for the AOL Scouts, and I am sure the others as well. Is this available in Excel format so I can update my own, or will you be possibly doing this as well? New books will probably be available next year. I am not sure if the original author of the file is going to update it. We have decided to go to ScoutBook moving forward, as it is "too hard" for some of our parents to submit information to the den leaders. I absolutely love your tracking sheets. They have been a life saver, to me as a den leader. I also, would like to know if you are planning to update them to the 2017 modifications. Thank you for sharing your work. You can contact me at candcarchuleta @ gmail . com . I appreciate it. The above tracking sheet and all the matching sheets have been updated. Click on the link that says 2017 to open the new sheet. Then click the link for the Wolf, Bear, and Tiger to download those also. To be clear, I am interested in updated (to the new modifications) tracking sheets for all dens. Wolves, Bears and Webelos. I use all of them as a Cub Master. I have made a fillable version of the webelo/aol pdf tracker. You can download it to your device, then fill out the adventures/electives as you do them. You will need a pdf reader installed on your device.Then, after you save the changes,just print them out or email them to your den leader or whoever is your awards chair. You can email me at ev@magnuminspections.com for a copy. Or, if the owner of the blog wants a copy to distribute, just email me and I'll send it to you so you may post it here. Thank you for all your work on the updated tracking sheets!! I noticed that Webelos / AOL Elective Art Explosion is missing options 3(h), 3(i), 4(a), and 4(b). Thanks. Looks like Aware and Care also has a 4(h) that isn't listed on this Webelos tracker. Thanks. Thanks so much! I forwarded your comments to Annaleis, and she updated them this morning. Thanks Annaleis!! Could you add your blog address to the end of this tracker so that when I download and save (and print) it shows? Then I know where to find it again when I want to send people to your blog to learn more! Just trying my best to comply with your request of "send people to the blog rather than just fw the download". Thanks -- I love this paper tracker! The 2017 update for Scouting Adventure has 1d as both required AND optional. Which is it? I LOOOOVE these tracking sheets! I have used them since tiger year! Will you be making a sheet for the new Lions by any chance? Does anyone have the Webelos tracking sheet for the new book that just came out this fall? The books we bought at Expo in the spring aren't even the books we are using this fall.